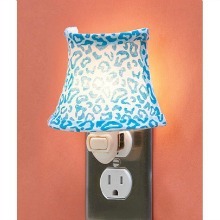 Fashionable night light features a trendy Leopard animal print fabric shade. Perfect for any room of your home! Has an on/off switch. Includes light bulb. 5″ x 4-1/2″ x 2-3/4″. Plastic. A night light as stylish as your wardrobe!